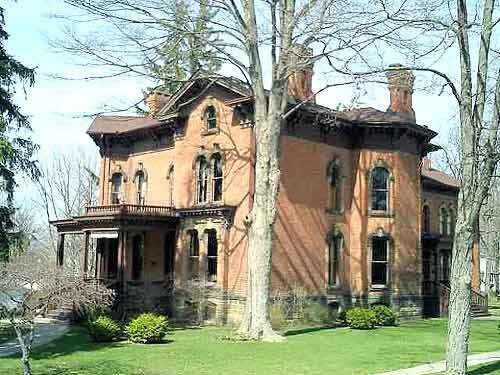 This 32 room Victorian Italianate brick home with its wide front porch and Palladium style windows is the renovated home of Ebenezer Oliver Grosvenor, one time Lt. Governor of Michigan. Grosvenor came to the Jonesville area in the 1830s and began working as a store clerk He also found employment as a banker and was active in local and state politics. In 1864, he became lieutenant governor and in 1866 was state treasurer. Grosvenor headed the commission in charge of building the Michigan state capitol building and his home was designed by the same architect as the capitol. The house museum contain an 1865 Chickering piano, Grosvenor family artifacts and Jonesville memorabilia. Grosvenor also was active in the development of the local school districts in Michigan and some of Jonesville's earliest school documents are now housed in the family estate.